When The Jazz and I were in Costa Rica for our luna de miel, we hung out with some of the Jewish community. It was a lovely experience. One of the things we really enjoyed was the transliteration of the gutteral Hebrew sound as "j." This creates many transliterations like "shajarit," "minja," and "jazzan." 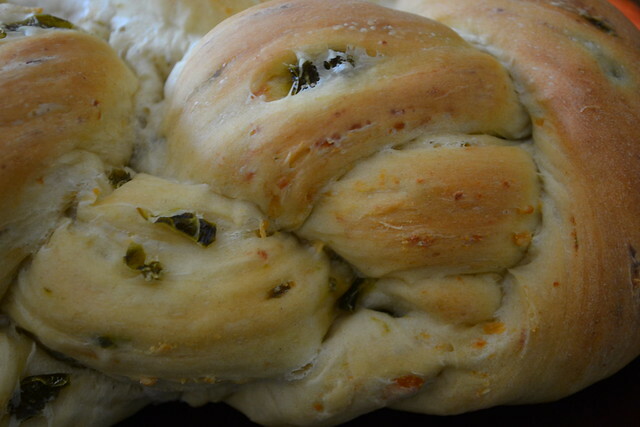 So I present to you, Jalapeno Jallah. I take NO credit what-so-ever for this recipe. 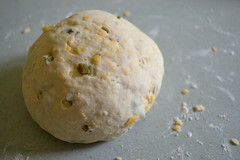 I stole it from Leigh Ann, the Frugal Ima, A Frugal Ima Super-Frugal Recipe: Jalapeno Bread. Since we're having dairy Shabbat, I used shredded cheddar. I added a few TBSP of oil because I couldn't get it to stick together. This week's braid is a four-strander that I found on youtube because I couldn't remember how I normally do this. (This happens to me almost every week. I like five-braids and six-braids. But when I want to do a four-braid, I can never remember how to do it.) I actually forgot to egg-wash it. But I don't think it needs it. It's quite lovely. Other things on the menu include mango, blueberry, peach salad, mexican vegetarian lasagna (my own mixture of things), guacamole, and strawberry ice cream. 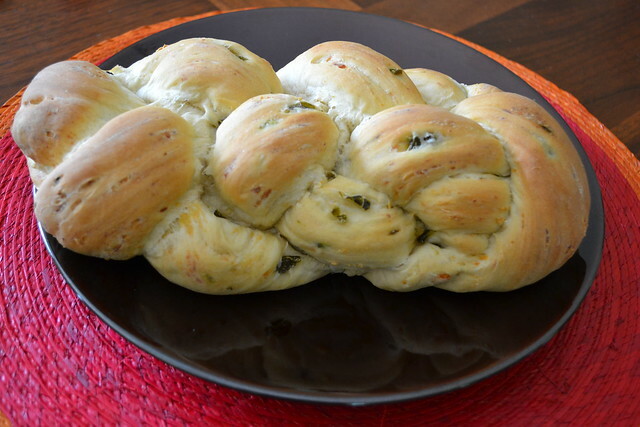 The Jazz will also sample this week's major win, Banana Chocolate Chip Jallah. Not the healthiest Shabbat ever, but you only live once, right? you didn't link the video but I *always* do a four strand braid - the strand that is the farthest right goes over, under, over... repeat till you are done. I love the way it looks.